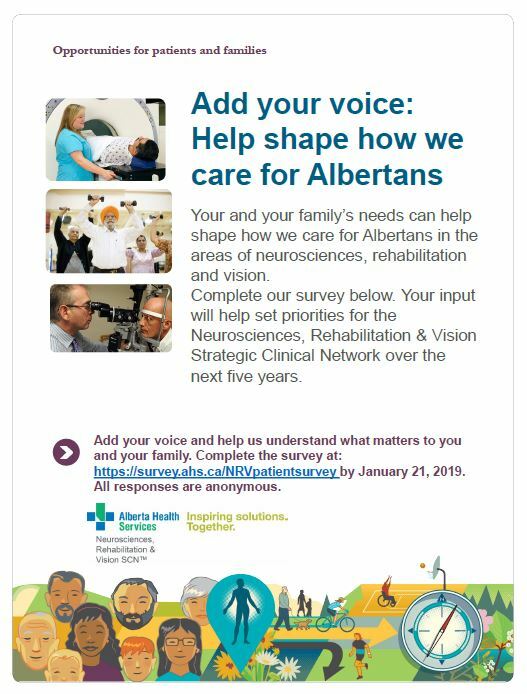 The Neurosciences, Rehabilitation, and Vision Strategic Clinical Network (NRV SCN) is looking for patient and family representatives to respond to their patient engagement survey. all eye disorders (including cataract, glaucoma, macular degeneration, diabetic vision loss and other eye disorders). The combined results received from this survey will be reviewed by the NRV SCN Leadership Team, presented at an upcoming Core Committee meeting and used to help inform the priorities of this new SCN. If these clinical areas are applicable to you as a patient and family advisor, we invite you to complete this survey, or share the survey link and attached poster with others who may be interested in providing input. The survey is open from December 21st, 2018 until January 21st, 2019 and should take from 10-15 minutes to complete. It can be found here.